The Wacissa River begins (where else?) but near the village of Wacissa, in southern Jefferson County. 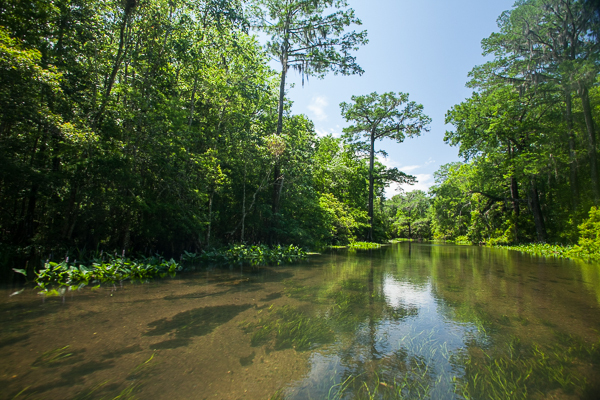 As the crow flies, the headwaters are but 20 or so miles from urban Tallahassee, but in terms of time, it may represent centuries. The headwaters are fed by numerous springs, including several with first magnitude flows. Depending on the season and recent rains, the waters may be clear and you’ll be able to see the bottom of springs like “Big Blue”. It’s over 50-feet deep. The river flows about 10 miles south to a point where it feeds a shallow hand-built canal that joins the Wacissa to the Aucilla River. The “slave canal” cuts off the sink and connects again near Nuttall Rise, just above US98. From Nuttall Rise, the Aucilla River flows into the Gulf of Mexico. Local historian David Ward insists that the bass, bluegills and shellcrackers taken from the pure waters of the Wacissa River are the best he’s ever eaten. And that’s easy to understand, as pollution and the sands of time just haven’t affected this river in the most natural of Florida places. To reach Wacissa, take CR59 south from US27 or north from US98. From the store at the crossroads, head east about a mile to the landing, where there’s a primitive launching ramp, a rope swing, and a small parking lot. There is no access to the springs or the river other than by watercraft, and the shallow channels lend the place to small motorized vessels or paddle craft. 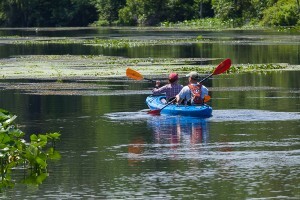 You need a boat or kayak to get to the springs – but it is worth it, as it is a beautiful river!